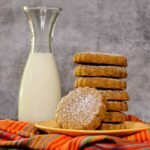 A recipe for Cinnamon and Piloncillo Cookies. They are homemade soft cookies made with ceylon cinnamon and piloncillo that have a molasses flavor. Combine piloncillo, water, and cinnamon in a sauce pan over medium heat. Bring to a simmer and stir occasionally. Once the piloncillo dissolves, lower the heat to keep it at a medium-low simmer for 15 minutes (it will thicken to a light syrup consistency). Remove pan from the heat. Remove and discard cinnamon stick. Add butter and honey into the hot liquid and stir until melted and combined. Whisk together flour, baking powder, baking soda and salt in a large bowl. Make a well in the center and pour in the liquid mixture. Stir until it is well incorporated. Beat 2 eggs and stir into the dough. The dough will be sticky and gooey. Place plastic wrap in the bottom of a mixing bowl with extra hanging on the sides. With a spoon or your hand, push the dough onto the plastic wrap and up the side of the bowl. Wrap the dough with the plastic wrap and refrigerate overnight. Preheat oven to 375 degrees. Line baking sheets with parchment or non-stick liner. Make an egg wash by beating remaining egg with about 1 teaspoon of water. Lightly dust work surface and rolling pin with flour. Divide dough in half. Roll out half the dough to 1/4-inch thickness. Cutout cookies with cutters pressing down on the dough and moving it slightly to make it easier to lift the cut dough. Place cookies 1-inch apart on baking sheets. Gently brush tops of cookies with egg wash.
Bake cookies for 7 to 9 minutes, until cookies are just beginning to turn light brown around the edges. Cool cookies on the baking sheet for 1 minute then transfer cookies to a wire rack and cool completely. Repeat steps with remaining dough. You can gather up excess dough after cutting the cookies, shape into another disk, and roll out for more cookies. Cool baking sheets completely between batches. Dust top of cookies with confectioners sugar. *If you cannot find piloncillo you can substitute 1 3/4 cup firmly packed dark brown sugar. Amount of cookies vary depending on size and shape of cookie cutters. Time stated does not include chilling dough overnight.